The Bama Performance team has been on a mission to have one of the fastest 2015 Mustangs in the world and so far they are succeeding! It all started with the Bama team running an 11.2 naturally aspirated pass in their 2015 Mustang, and has since developed into many milestones for the Bama team. This past weekend, they set another milestone at the track with their 2015 Mustang GT and show no signs of stopping. Bama decided that an E85 tune with larger injectors was the right course of action for going faster, and they were dead on. By switching to E85 with better injectors they were able to make more power and faster passes in the 1/4 mile. With an updated tune and better injectors, Bama Performance tapped into the laughing gas once again to see how much they could improve upon their forced induction record. Bama went 10.2 @ 128 MPH in their 2015 Mustang GT with a nitrous express coyote nitrous kit. 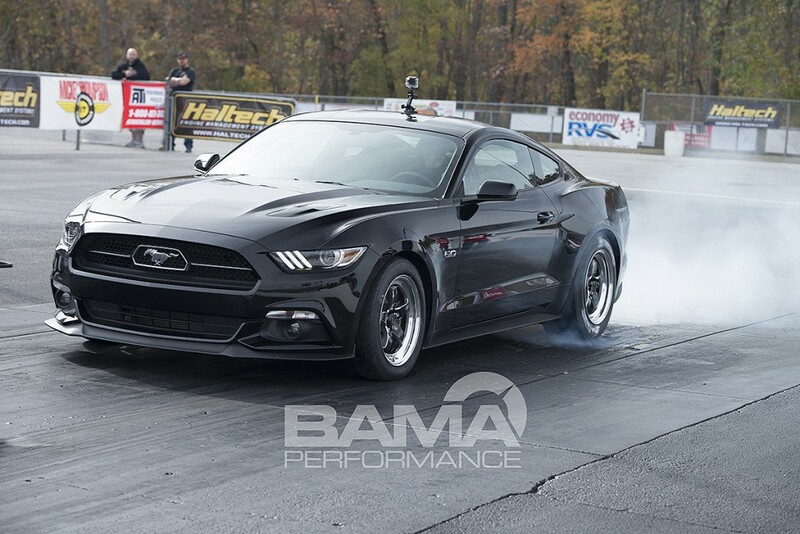 Bama Performance continues to tune their 2015 Mustang to make it as fast as it possibly can go, which is backed up by these impressive times at the track. Stay tuned, as the Bama team has a lot more in store for the 2015 Mustang! Previous Entry 2015 Shelby GT350 Officially Revealed! Next Entry Video: Ken Block’s 1965 AWD Mustang is a Tire Shredding Monster! Amazing, keep up the good work AM and BAMA. Cant wait till we some of those custom parts available.